Help Richard keep these classes open by donating today ! Or join a class with a monthly Subscription! Richard Leirer is one of the most experienced and accomplished Qigong teachers in the US. He has been a serious student and practitioner of the internal arts for over 46 years. 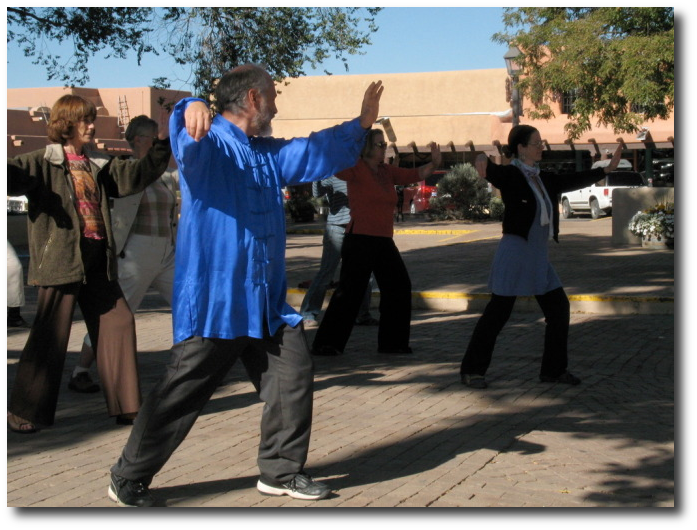 He is considered by many to be one of the few American Qigong Masters. Richard has an ongoing Tai Chi/Qigong therapy program for pain management and surgery rehabilitation at the world famous Cleveland Clinic hospital. It is the only program like it in the United States. Richard is an accomplished Medical Qigong Healer. His healing qi has been emitted during surgery operations at the Cleveland Clinic Hospital to lessen blood loss, enhance healing and speed recovery time. Call or write Richard to schedule an appointment. His Medical Qigong Therapy uses qi energy and the five elements to create a healthy balanced body. What is Qigong & Tai Chi ? Qigong (pronounced chi kung), often called acupuncture without needles, is a health maintenance technique similar to Tai Chi. Qigong can be translated as “working with energy” – the same “energy” used in Chinese Traditional Medicine and Acupuncture. Some Qigong methods involve mindfulness; others can be more meditative with little movements. The combining of movement with stillness works best for many. Qigong has a 5000 year history of development in China. As early as the “Spring and Autumn” periods 770-221 BC, Qigong had achieved high level recognition. During its evolvement in thousands of years, Qigong has progressed, developed and gained sophistication. At the present time, Qigong practice can be classified into five schools, namely Taoist, Buddhist, Confucianist scholars, WUSHU masters (Martial arts), and Chinese Traditional Medicine. Many current Qigong practice methods employ combination of different schools. It is estimated over 200 million people are currently practicing some Qigong forms. In ancient times Qigong was called Tu Na (exhaling and inhaling), Lian QI (training of vital energy), Jing Gong (sitting quietly meditation), or Nei Gong (internal self-exertion training); Silk scrolls discovered in ancient tombs at Xian have elaborate drawings of famous movement Qigong forms called Daoyin exercises. After recent study and organization in China it is now generally agreed to use the term Qigong to describe all of these ancient practices. Qigong means to cultivate vital energy. Qigong is also becoming a science which explores the mysteries of human life, it’s a way of improving health, treatment and prevention of disease, and traditionally was a means to increase longevity. It is believed that many body functions may be controlled by one’s self. Thus Qigong is sometimes called self cultivation and is recognized as a health maintenance technique. The active form combines the mental consciousness and Qi-energy with the movement of the extremities, ( such as standing form, TAIJIQUAN Qigong, Daoyin, An Mo self massage, etc. ) The goal is to activate the circulation of vital energy and blood and to quiet the mind monkey while moving body parts. It is termed ‘”external Qigong exercise” due to its visible active movements of the body. The first step is the foundation, in which the feeling of QI begins to appear. When the change of qin into Qi is complete QI can be felt and then may circulate along REN-DU channels, i.e. along the middle lines of chest, abdomen, back and head, which is called “small heaven” . When the change of QI into spirit is completed, QI can circulate along all the main channels around the body, which is called “big heaven”. For one who has completed the step returning spirit to nothingness, it is easy to enter the nothingness state, a high-level Qigong state, in which people feel the body is disappearing. Qigong practice is unlike other meditations that are popular today and must be performed with the guidance of a competent instructor. It is similar in nature to advanced pranayama yoga techniques and will provide the practitioner with a high energy feeling in a short period of time. Over time a Qigong practitioner may increase his skill level and some individuals have obtained unusual or extra ordinary human functions. Generally, good health, longevity and the opening of wisdom is a goal for most Qigong practice. It can be performed by all individuals regardless of age or body condition. Tai Chi can be considered a Qigong Form. The Chinese characters for the Word Tai Chi literally translate as one centered person, between heaven and earth who knows how to be relaxed as a pine tree, knows how to stand like a tree and uses the hands and mouth in a balanced fashion. Internal Chi Kung training is activated while doing Tai Chi forms at advanced levels.